Remote controller can choose multiple cleaning modes, such as auto cleaning, single room cleaning, edge cleaning, time-set cleaning, schedule cleaning etc. With a large-capacity dust bin, you don't have to worry about emptying it so often. Prepared with one rolling brush, two side brushes and a powerful suction ensure a thorough clean. The low-profile design facilitates cleaning under tables and chairs along with every nook and cranny. Prior to cleaning, please clear the intended cleaning area of objects that can obstruct the I3's movement including cords, wires, etc. ✔STRONG SUCTION ROBOT VACUUM CLEANER FOR HOME - Try our 80% higher suction than others powerful robotic vacuum cleaner with an advanced auto-clean system! Clean your house with the click of a button on the robot or remote control - free up your time to do the things you love. The low-profile design facilitates cleaning under tables and chairs along with every nook and cranny. ✔MULTIPLE CLEANING MODES FLOOR CLEANER - Auto, spot, edge and single room cleaning modes will meet your all your different vacuuming needs. This Touchless Vacuum Cleaner will start automatically on its schedule or timing program and return to the docking station in time to recharge when battery runs low. ✔SMART MOTION NAVIGATION SYSTEM - Our I3 Robot Vacuum Cleaner is smart enough to clean every corner of the house. Infrared sensor for evading obstacles and drop-sensing technology avoids bumping into objects or falling off stairs. Two side brushes, a rolling brush and a powerful suction ensure a thorough clean with a low-noise level of less than 60dB. ✔SUPERIOR BATTERY AND HEPA FILTER - The 2600mAH large capacity Li-ion battery delivers enough power for the robot to operate for up to 120 minutes. A 500ml anti-spill dust box supports longer cleaning sessions, whilst a high-efficiency air filtration system prevents debris and hair spillage when cleaning the dust box. 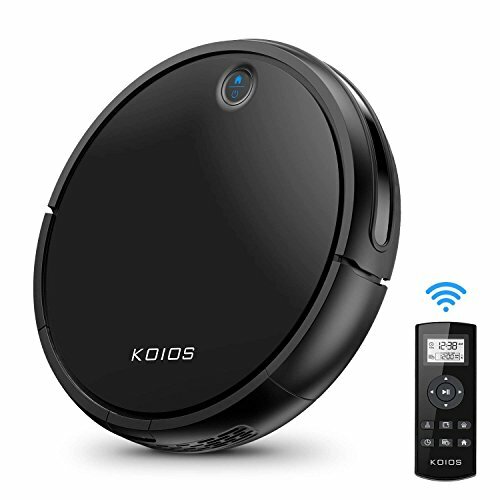 ✔FULL ACCESSARIES, 30 DAY MONEY BACK GAURANTEE AND 1 YEAR WARRANTY - You will get Koios Robot Vacuum Cleaner, remote control (requires 2*AAA batteries, not included), Li-ion battery, AC power adapter, charging dock, HEPA-style filter, side brushes, clean brush, screwdriver, screw, user manual in the box. And use I3 with pride and confidence 30 days Money Back GUARANTEED and 1-year warranty. If you have any questions about this product by Koios, contact us by completing and submitting the form below. If you are looking for a specif part number, please include it with your message.